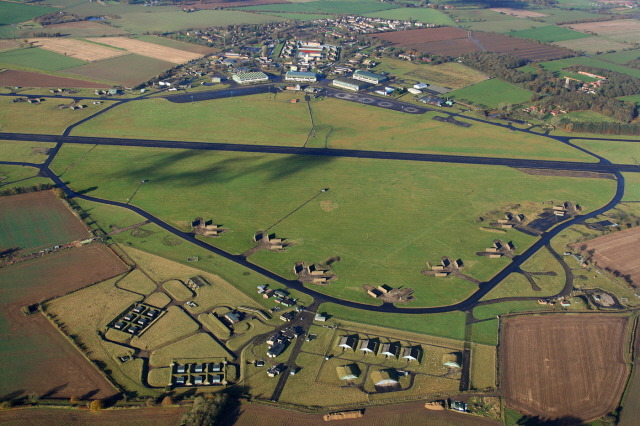 Former RAF Coltishall is one of Norfolk’s most important historic airfields, now in the ownership and care of Norfolk County Council. Our plan is to develop the site with due regard to its heritage and in recognition of all those who served there. Our aim is for people who live and work there today and visitors to see, understand, appreciate and enjoy its heritage. The site is located on a plateau close to the confluence of the River Bure and two of its tributaries. There is a wealth of archaeology here, including prehistoric burial sites, an ancient field system and a Roman road and settlement. Historic maps show later features including a post-medieval hamlet known as Batley Green, Scottow, which was swept away by the construction of the airfield. For more information, a Batley Green handout is available. RAF Coltishall was originally built as an “Expansion Period” bomber base in 1939, but was changed to a fighter station in 1940. The main features of the airfield were four hangars, a control tower, a perimeter track with hardstandings for dispersed aircraft, bomb stores and, initially, a grass take-off and landing strip. More information is available about Hangar 3 and its bullet holes. Between 1940 and 1945 the station was home for more than 80 fighter squadrons, including Polish and Czech units. A number of famous aces served here, including Douglas Bader, “Sailor” Malan and “Cats Eyes” Cunningham, flying Spitfires, Hurricanes, Beaufighters and P51 Mustangs. By the end of the war Coltishall had destroyed 207 enemy aircraft, with 48 “probables” and more than 100 damaged. Coltishall became a front line fighter station in the first half of the Cold War. The runway was lengthened and strengthened to take jet powered interceptors and, occasionally, Vulcan bombers, two of which were stationed at Coltishall during periods of increased tension. Aircraft were protected on the ground by concrete blast walls, and new sheds were built to house air to air missiles. Between 1964 and 1974, Coltishall became a training station for Lightning pilots. 1974 saw the arrival of Jaguars, which were deployed in the First Gulf War (1990-1) and Bosnian War (1993-4). Further information about the mystery of Building 139 is available. In 2006 the station closed after 66 years of continuous service. It passed to the Ministry of Justice who converted part of the site into Her Majesty’s Prison Bure in 2009. The former married quarters - 382 houses - became the new community of “Badersfield”. The rest of the site was purchased by Norfolk County Council in December 2012. Many of these features and other parts of the site can be seen in our online gallery. Scottow Enterprise Park, Lamas Road, Badersfield, Scottow, NR10 5FB. The site address is Scottow Enterprise Park, Lamas Road, Badersfield, Scottow, NR10 5FB. Please note that access to the site is currently very limited. Please check the Scottow Enterprise Park website for further information and contact us before you visit. Organised public tours are being led by the Spirit of Coltishall Association during Heritage Open Days, 7th and 8th September 2017. These tours must be booked in advanced via the Heritage Open Days website. Please contact the Spirit of Coltishall Association if you would like to arrange additional tours.